Fast Cash Club is a system that can supposedly help you make thousands of dollars through ecommerce. 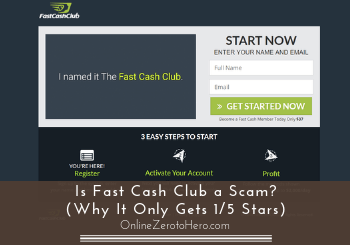 But is Fast Cash Club a scam or one of the legit online opportunities? It definitely is possible to make thousands of dollars with ecommerce, but let me reveal right away that in my opinion this system will not be the best way to learn how to do this. In this Fast Cash Club review I will show why, and show you the red flags you NEED to know before joining. Fast Cash Club claims you can learn to make A LOT of money really fast through Shopify, if you get their system. In my opinion, you should however NOT expect an automatic and super easy way to make money from this system – it just has too many red flags. What is Fast Cash Club and what does it offer? Fast Cash Club is a system that claims you can make fast money through ecommerce by following their system. If you do not have much experience with internet marketing, it might be difficult to see exactly how this would happen, as you are not told many details in the video. You are mainly just told that it is the world’s first drag and drop ecom profit system. Fast Cash Club is supposedly a drag & drop system. The whole drag and drop claim always makes me worried, when it comes to making money online. So when I saw this, I immediately became alert, as it is not just that simple to make money online. But I gave Fast Cash Club the benefit of the doubt and continued looking into it. When you get further into the sales video, you will be able to see that the way you make money with the system is by learning how to make money with a Shopify store. This is definitely a legit way to make money online, and there are many people making really good money with Shopify stores. However, in my opinion, Fast Cash Club will very likely NOT be the best place to learn this for various reasons, I will go over below. What I like about Fast Cash Club is that it talks about a real way to make money online, and you are actually told in the sales video what the way is. Also, you will get access to some training about how to set up a Shopify store. However, you should in my opinion not expect too much from the training. I have not bought the training myself, as I always do a lot of research before buying any product. When it has too many red flags, I will not buy it, as I do not wish to support systems that use certain tricks, as I will show you below. From my research, I was, however, able to find out that the training you will get will be some generic PDFs with some basic info about Shopify. This is very typical for programs that have sales pitches like Fast Cash Club has. It promises a lot, you will get some training, but it will not give you as fast and as easy results, as you might think. So even though you get access to some training, it is NOT training I would recommend – especially not if you expect the training to fully live up to the claims on the sales page. But let me explain the red flags I spotted when it comes to Fast Cash Club, and the main reasons I am not recommending this system, and why it is a system I have decided to stay away from myself. Fast Cash Club red flags revealed! 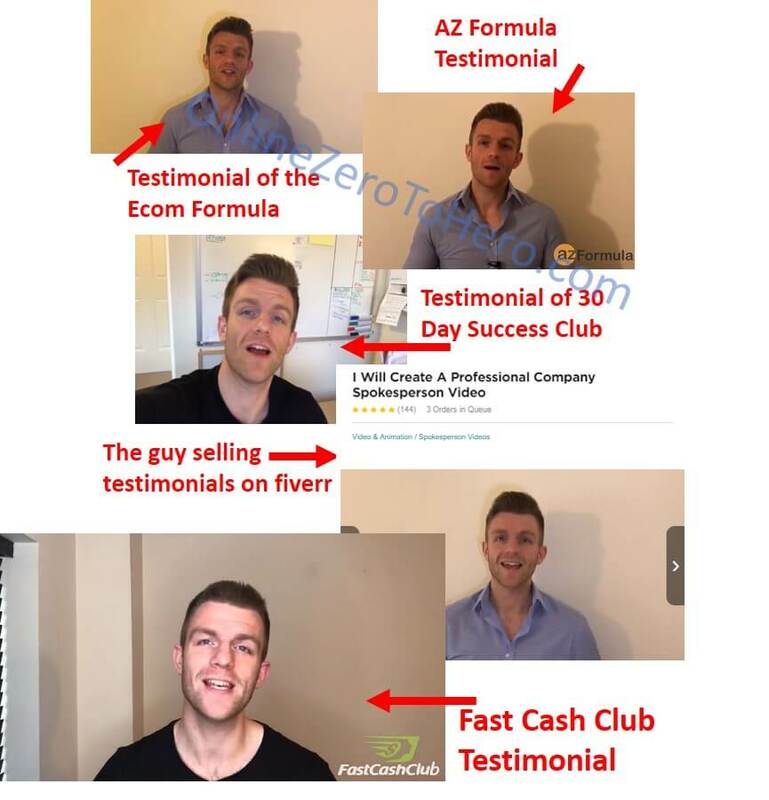 In my opinion, and based on my years of experience with internet marketing in general, there are a lot of red flags when it comes to Fast Cash Club, and there are a lot of things you are not told. These are things you need to consider before investing any money. It is always good to know, who is behind any money making program online, as it tells a lot about the credibility of it. You are told that the owner of Fast Cash Club is John Harris, and you also see a picture of him. However, John Harris is not the real name of the owner – this is not just something I say by using logic, but also something Fast Cash Club itself reveals in its disclaimer. The disclaimer reveals John Harris is just a pseunonym. The disclaimer directly says that the name John Harris is a pseudonym. 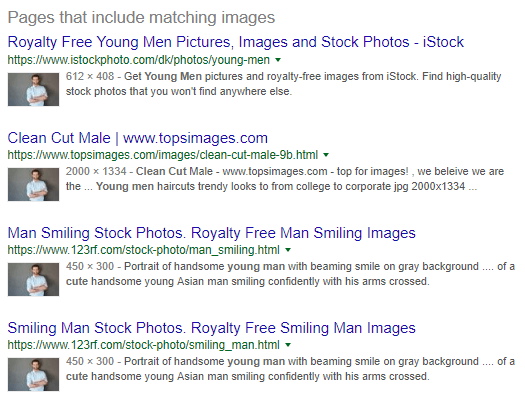 The image of “John” seems to be a stock photo. The image shows up on A LOT of other websites, and it seems to be a stock photo. So both the name and the image seems to be false. There can of course be many reasons for this, but to me it is a big red flag, when you do not know who the owner of a program is, when a pseudonym is used, and when a stock photo is used to represent him/her. You definitely have to ask yourself, if you are willing to hand your money over, when you do not know, who you are handing them over to? Unfortunately, it is very easy to buy testimonials of products and services online today, and this is something make money online programs use a lot. Fast Cash Club is also using this, and the testimonials in the video are bought. I right away recognized several of the supposed members from sales videos of other products I have reviewed. 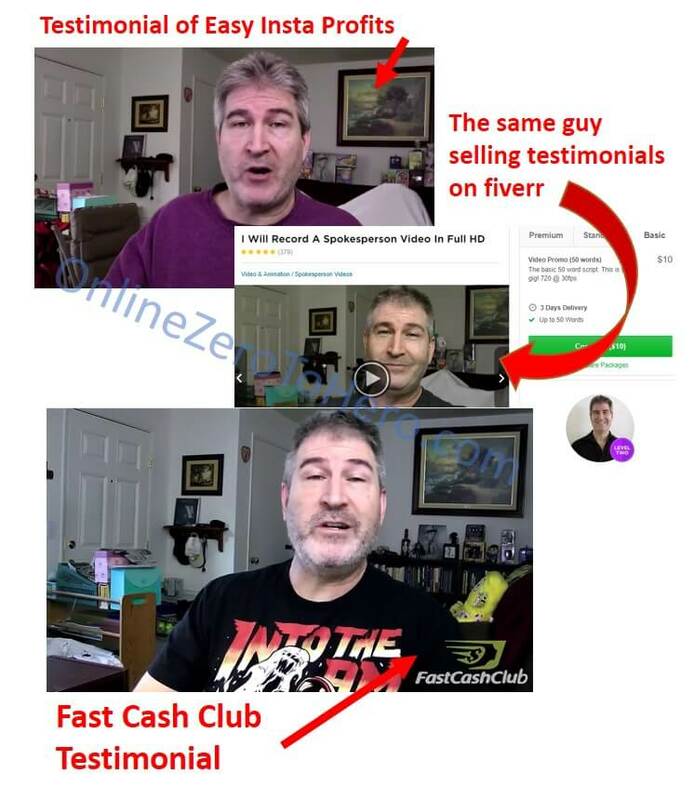 The guy below is for example selling testimonials on fiverr, and I have also seen him in quite a few other sales pages like for example for the 30 Day Success Club, where he claims to have used a system that makes him a lot of money. Example of a false Fast Cash Club testimonial. As you can see on the image above, he is in quite a lot of sales videos. But let me give you one more example. Another example of a testimonial given by an actor. I have for example seen this guy giving a testimonial for Easy Insta Profits as well, and he is selling videos like this on fiverr. You could, of course, argue that maybe these actors are both selling testimonials and have used the system.